Myanmar is a country endowed with historical, cultural, and natural resources. Endless miles of idyllic coastline with untouched and unspoiled beaches add much glory to her interest.Seven beaches are waiting for visitors to come and relax. 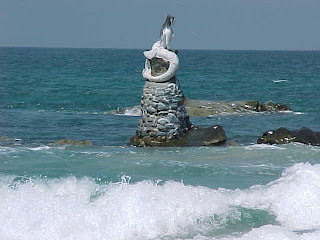 Among them, Ngapali, Chaung Tha, and Ngwe Saung beaches are famous for both local and foreign visitors. The rest of the beaches still need to be promoted. Since Myanmar beaches are striking in their natural and unspoiled beauty, both local and foreign visitors like to relax there. Generally, the beach-goers turn out in their multitudes between mid-October to mid-April. Visitors marvel at the beautiful sunsets as they relax on or near the white sand. 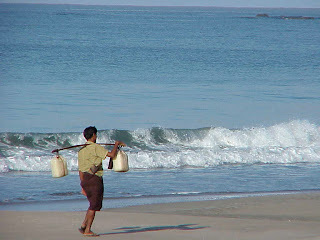 Since the majority of beaches in Myanmar face west the spectacle is stunning. Visitors can fully relax in the quiet environment at the beaches as there are no speedboats, no crowds, no hawkers, and no masseuses. Traditional bullock-cart riding, horseback riding, cycling or simply walking along the shoreline will give you pleasant memories which will last a lifetime. Instead of the loud noise from restaurants and crowd, you’ll hear the rubbing sound of the coconut plants and the rhythm of waves lapping at the shore. You will not see discarded tins and plastic bags on the beach shore, only seashells spread on the ground, waiting to be picked up as a momento. Relaxation at beaches in Myanmar is not just to sit on the white sand and splash around in the sea – there are so many other things to do. Ngapali Beach is 50 minutes flight northwest from Yangon and in the high season some domestic airlines also connect to it from Bagan or Heho airports. There are no suitable roads to reach it. Located on the Rakhine coast, near the small town of Thandwe, it is an unspoiled beach, stretching over 3 km and offers the blue-green sea of the Bay of Bengal, white sand and swaying palm trees for visitors to enjoy. Nearby are a couple of fishing villages which are interesting places to visit, either by bicycle or by car. There is an elephant camp near the town of Thandwe which is an interesting excursion for those who tire of the sun and sand. There are no jet skis or noisy motor boats to spoil the serenity and tranquility of this untouched beach. Although there are only a few hotels (with more are being built), there is a full range of quality with a predominance of deluxe hotels. Ngapali Beach is a great place to end a Myanmar tour while relaxing with water, sun and sand amidst peaceful surroundings. Ngwe Saung is also on the western coast of Myanmar on the Bay of Bengal, nearly directly west of Yangon and a bit south of Ngapali. It has become popular with tourists in just the last two or three years and the quality of the beach, sand and water is comparable to Ngapali Beach. There are only a few hotels (most of them are deluxe or superior category) however a more are being built. Until recently, the beach could be reached only by car (about 5 hours drive) from Yangon. Like Ngapali Beach, the beauty of the beach is unspoiled and visitors can enjoy a peaceful and relaxing holiday. One can visit small fishing villages and local market, explore the country side by bicycle or enjoy a boat trip to the offshore islands. 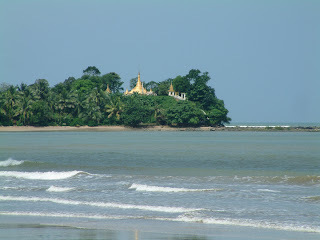 About 42 km west of Pathein, a divisional town lies Chaung Tha beach. No flight between Yangon and Chaung Tha. Car journey from Yangon to Chaung Tha via Pathein takes 5 hrs. The beach curves inwards in the shape of a crescent stretching for nearly a mile and has the white sand with crystal clear blue water. There lays an islet called Thebyu which means white sand, one mile diagonally across Phokalar Island is formed by oysters and shells carried and piled up by tidal waves. 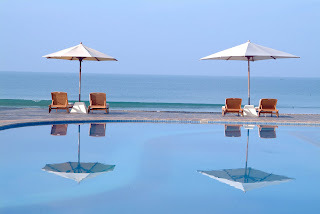 Modern facilities can be found in bungalow type beach resort hotels. It is one of the most beautiful spots in the world.